Based on the material they are made from, industrial belts are classified broadly as either rubber belts or resin belts*. We leverage the three core technologies that we have cultivated since POVAL KOGYO was founded to provide custom-made products suited to the belt’s applications, environment, and customer needs. * Resin belts are laminated/composite belts with a core made mainly from polyester fiber coated with a resin such as polyurethane. 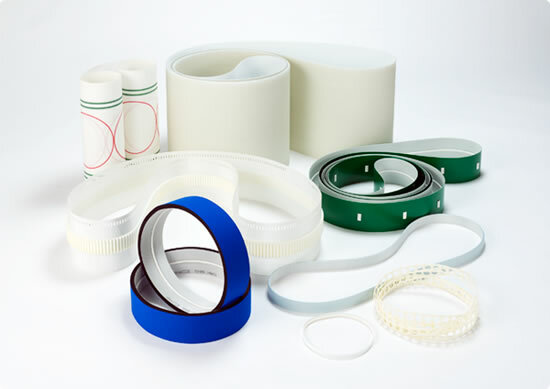 Among other features, resin belts are (1) are thin belts that consume little energy during use, (2) are easily processed to suit intended uses, (3) offer excellent heat resistance and chemical resistance, and (4) are odorless and non-hazardous. We manufacture and sell a wide range of conveyor belts used by industries, mainly the iron and steel industry and the food industry. Our belts include belts that fulfill the desired function even in special environments such as high and sub-zero temperatures as well as original conveyor belts made by combining the same or different materials. These are high-quality products in which the basic function of carrying things forward has been pursued to the maximum. These are special belts that not only move things but also have special features needed in manufacturing processes. We can provide custom-made belts, even orders of just one belt, such as belts for spinning that remove debris stuck on the cotton and that determine the thickness of the thread in the thread-making process, and belts for iron and steel that prevent slackening in the receptacle when winding iron and steel around a reel. These products have won high praise from users. These are belts that are attached to two wheels to transmit driving force. POVAL’s flat belts bend easily, making them perfect for small cars. Excellent flexibility and elasticity as well as high resistance to kinking characterize the nylon cores. The strong point of these belts is their ease of use, which is not found in ready-made products, and which is achieved through the combination of the same or different materials. Urethane timing belts were created in cooperation with Megadyne S.P.A., a manufacturer of timing belts based in Italy. Since these belts combine the merits of timing belts and polyurethane rubber, they are perfect for clean conveyance and driving with high precision and low noise.